It seems very appropriate to include a Parley P. Pratt hymn close to the start of the hymnal. He was, after all, one of the earliest and greatest missionaries of the Mormon movement. And he was a lover and writer of poetry. 9 of the hymns in the 1985 hymnal were set to his texts. It makes me wonder if the new hymnbook committee will restrict these great deceased poets and composers to only 5 hymns in the same way they are restricting new submissions to 5 each. . . . Something tells me that Parley Pratt and other prolific and now deceased hymn writers will be allowed many more entries than us, especially as many of their hymns are so well known and loved. Oh well. Like Hymn #1, "The Morning Breaks," Pratt's text focuses on the bursting forth of the gospel's restoration. It takes a step further too. It brings together the gospel from the ancient days when Jesus was on the earth with the restored gospel, returning to earth. He combines them as if one and the same, which is indeed, what the Church teaches. Pratt described his dedication to building the restored kingdom when he said, referring to his book 'Voice of Warning,' "Should the author be called upon to sacrifice his life for the cause of truth, he will have the consolation that it will be said of him, as it was said of Abel, 'He being dead yet speaketh.'" Or in this case, "singeth." The composer of this hymn is the world famous Tabernacle organist, Alexander Schreiner. He wrote this hymn while a professor of organ and music at UCLA and it was included in the 1927 LDS hymnal. While teaching at UCLA, Schreiner struck up a friendship with none other than the most loathed composer of the 20th century, Arnold Schoenberg. For most lovers of classical music, when they hear the name 'Schoenberg,' they cringe. He is responsible for the birth of atonality and the techniques of serialism. In other words, much of his mature music is not exactly easy on the ears. It is often harsh and powerfully dissonant. I believe poor old Arnold deserves some defending. I took an entire semester course on him during graduate school. We studied every single piece of his. His early compositions are fantastic! They are Brahms + 20 years of harmonic development. Lush, romantic, emotional, lavish. He took what he saw as the only way forward in pushing harmony past the breaking point where it had been headed for decades. He plowed through what we call the "tonic-dominant-divide" and emancipated the dissonance. This was his term for the freeing of the gravitational pull that we feel so strongly between the 1 chord and the 5 chord. No longer MUST things "resolve" the way they'd resolved for centuries in music. He set them free. That's a very watered down version of how he explained it. I think the guy was brilliant! Even in the hyper-dissonant pieces that I have a hard time listening to, there is an absurd amount of genius and craft. His counterpoint is exquisite. But he's not the kind of composer whose music I turn on to feel inspired or encouraged or motivated. Not really a toe-tapper. Well, Schreiner, the composer we're supposed to be talking about...sorry for the little tangent...was pals with Schoenberg. They both taught at UCLA and were both great composers. When Schoenberg passed away in 1951, his wife, Gertrud, asked Schreiner, now a tenured principal organist at the Mormon Tabernacle, to return to LA and play at her husband's funeral. Which he did. I love this little quirk of music history. Now, what about the hymn itself? Schreiner was a professor of theory and one of the greatest organists of the 20th century. You can be sure he knew what he was doing. The hymn is well written all around. Most of it, I like. But there is something that doesn't quite fit for me. This small detail makes it not quite the homerun hymn it could be. Of course, this is all super subjective. But hey, that's what blogs are for, right?! Just one crazy composer's opinion. First, there's something I want less experienced composers to notice. Do you see how the opening notes of the melody go up in stepwise motion, F#-G-A? It's a nice little rise, followed by a leap down do D, the tonic, and then an identical rise from D to E and on to the F# where we started. A lovely little melodic kernel. But notice the opening bass line. It takes the exact same trajectory as the melody starting on D, the tonic, and stepping up to E and then F#. One of the most important rules of voice leading--the discipline of moving each of the 4 voices in a hymn texture correctly without errors that make the hymn feel jarring or out of joint--is to keep most of the motion between the melody and the bassline, generally speaking, in contrary motion. In other words, the general shape of the melody should be opposite to the general shape of the bass line. If the melody rises and then falls, it's good and often standard practice to have the bassline fall and then rise. Schriner uses exact similar motion. In his hands, it doesn't worry me because I know he knows how to avoid what could turn into feeble voice leading. I just want you to make sure you recognize how he avoided turning 'similar' motion into 'parallel' motion. One of the Cardinal Sins of voice leading in all music, and especially in hymn writing. If, for example, he had copied the bassline precisely in the melody, having both parts start on D, step up to E, and land on F#, that is not only 'similar motion' (2 voices moving in the same direction, up or down), it is what we call 'parallel motion.' Das ist verboten! (This is forbidden!) Parallel motion in Octaves, 5ths, and Unisons is WAY against the rules. So, how does Schreiner avoid the dreaded Parallel Octave? He moves in 'similar motion' at the interval of a 10th, which is a 3rd plus an octave. Great! Beautiful! Perfect! We can do parallel 3rds, 6ths, 10th, and 13ths all day long. Mozart sure did. No issues there. Okay, now, a couple of things that are very strong, and then the bit that doesn't quite sit right with me. Notice quickly that the opening 2 bars and the final 2 bars are nearly identical. The only difference is the last little tag on "mankind." Schreiner has the tune step right down to a final low Do with a perfect 5-chord to 1-chord cadence. Excellent, A+ writing. The middle 4 bars are my favorite bit. This is bold melodic writing. It fits the mood of the text very well. And the G#s and the A# in the tenor voice bring that positive, lifting kind of harmony. These chromatic filler notes, when they are sharps, add gravitational pull upwards to the adjacent note, tonicizing that chord and keeping the feel of the music looking upward towards the heavens. The rising step-wise motion bass line in bars 5-6 is particularly strong writing and is accompanying the descending melody with perfect appropriate motion. Ok, now for the bit that I'm not entirely sure about. It's that C-natural I've circled in Cardinal Red. Now, musically, there's nothing wrong with this at all. In fact, it's lovely. But let's talk about what this C-natural does to the mood of the piece, the affect. When the 7th scale degree--in this case, since we're in D-major, the 7th scale degree is C#--is lowered chromatically by a half step, it creates a particular kind of sound and a specific kind of feeling. Often, the great composers like Bach, save this little trick for at least 2 moments in their music. First, they use it in the Coda, the tail end of a piece when they want to create a sense of 'coming home' in a stronger way than what the diatonic harmony (harmony that sticks exactly with the key signature) can offer. So they play a 1 chord, in this case, D-F#-A, and they add a lowered 7th scale degree to it. Normally, if you add the 7th scale degree to this 1 chord, you'd get D-F#-A-C#. But that doesn't give off the odor of coming home to Mom's best home-cooked meal. To bring out that almost nostalgic aroma, they would lower the C# to C-natural. And where does the C-natural pull us down to? It pulls us down to the 4 chord, the Sub-Dominant. Now, Sub-Dominant chords have a distinctive feel to them. You know how lots of churches end their hymns with an extra "A-men"? What the organist does is finish the hymn by playing the 1 chord, and then playing the 4 chord, the "A" of the "A-men" and then the 1 chord again, the "-men." So, the 4 chord resolving to the 1 chord often gets called the "Amen" cadence. We also call this a "Plagal" cadence. This gives it that strong "coming home" feel. The second most common way this lowered 7th scale degree is used is in "Pastoral" settings. When they are trying to depict shepherds and sheep grazing safely in the fields. No wolves in site. They are in safe, green pastures. That lowered 7th scale degree resolving down to the 4 chord is the classic way to evoke this feeling. It's beautiful. Some of my favorite music does this. Schreiner's use here is similarly beautiful. And using it right away at the outset of the hymn gives it that warm feeling of coming home. For me, however, this is out of sync with the text. This is what bugs me. It's a small detail, and I'm being super "composer-picky" here, but I guess that's my prerogative. I think this is a compelling, bold, authoritative text of the Restoration. Giving it that "shepherd" feel right at the start doesn't do it for me. I want more of the kind of writing he uses in bars 3-6. That's the stuff the text describes! Now, to argue the other side, I can see why one could say that "truth" is something we experience internally. And you could say that the Restoration needs to touch everyone personally at the heart to bring about the kind of conversion Parley P. Pratt had. 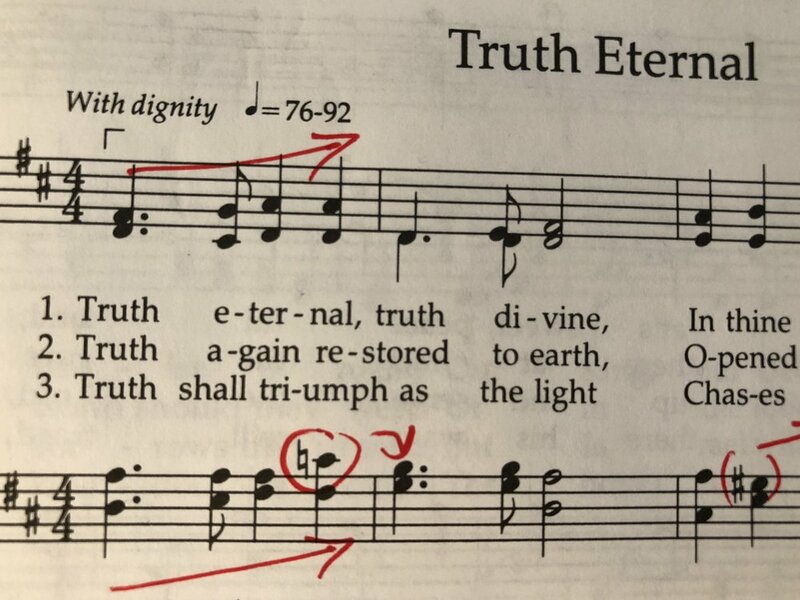 So, by using the lowered 7th scale degree, the "shepherd" music tactic, you could say that Schreiner is coloring the hymn with both sides of the conversion coin. The introspective in bars 1-2 and 7-8, and the extroverted missionary spirit in bars 3-6. If I had composed this, I would probably have saved the lowered 7th scale degree for ONLY the final phrase. I would have started the more muscular music right from the start. I like the idea of having the opening 2 bars be nearly identical to the last 2 bars. But wouldn't the final 2 bars be even stronger if that C-natural was used only the ONE time, right at the end? I think so. It would have been that 1 little gem in the piece. That 'certain something' he was saving to round the piece off. Instead, having both at the start and finish, it's a little weaker to my ears and my emotions. Like I said, I'm being tough on brilliant old Schreiner. And you may disagree with me. That's fine. Let me know what you think. I'd love to hear. Does it belong in the new hymnal? I'm not sure. I think the text is 100% great. I think the music is 85% great. Perhaps this is a hymn text some modern LDS composer should take up again and write a new version of this hymn. I don't know, but I'd bet Pratt wrote more than 3 verses. Often these kinds of short-stanza poems have more like 6 or 8 stanzas. Someone could make a real powerhouse of a hymn out of this text. Happy writing or singing or playing or whatever you do! P.S. If you'd like me to email you each time a post a review, click the "Subscribe" button here. To me, this hymn is a tiny gem. Three verses in two stanzas, but I think this is a tremendous example of great text and music writing. The practice of seeking to objectively view and critique the hymns in our 1985 Hymnal serves to reinforce to me how some of our hymns are wonderful contributions to hymnody generally and excellent examples of hymn text composition matched with equally great tunes. This is especially shown in the first six hymns of the book. As an LDS organist, Alexander Schreiner looms large as an influence. Several of my organ teachers studied with him, and my father at an early age would call me Jason ‘Alexander Schreiner’ Gunnell. I find this hymn to possess a stately reverence that works well to convey the message of eternal restored truth. It is this sense of dignity that would lead me to register this hymn differently from the first three. I would not use a mixture at all in this hymn, opting for more gravitas. Perhaps I would experiment with a nice Hautbois if one is available, and perhaps a subtle 16’ at some point as well. I find that a very nice subdued 16’ adds so much to a hymn like this if it is available. I think quarter note equal to 96 beats per minute is about the tempo that I take it at.